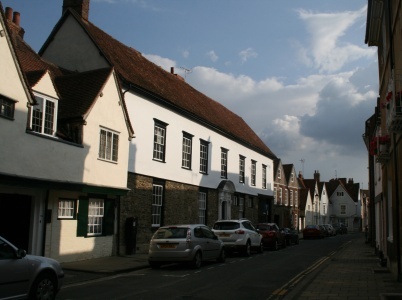 East St Helen Street is one of the most idyllic streets. But a couple of nights back a large number of cars got keyed. That is where a sharp key or coin is used to scratch vehicles. A scratch takes a second to do but causes the car owner hours of grief and money to repair. I remember back in the 60s, when I was at primary school, our head mistress told the whole school off because a car had been scratched in a nearby road. She did not want our school’s reputation tarnished. Why do some people scratch other people’s cars? 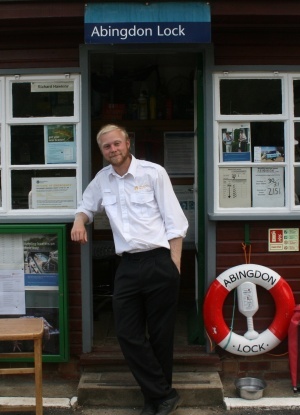 Rich Hawkins has taken over as the new Abingdon lock keeper, and will be moving into the lock house at the start of September. 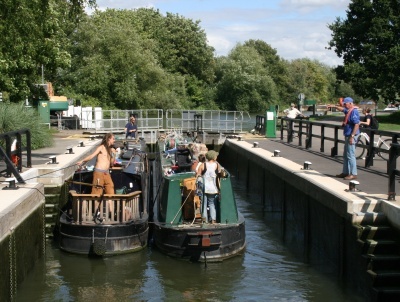 He has previously served as a relief lock keeper on the River Thames for five or six years. It sounds as though he has already been in charge at Abingdon since last winter when the River Thames had strong flows and was close to flooding on two or three occasions, and when Abingdon’s lock chamber was relined. He writes an occasional column called ‘Go with the flow’ in the Abingdon Herald – as one of the new community writers. There could be excitement ahead as the lock gates are to be refurbished this coming winter. Then Abingdon Hydro could build some electricity generating turbines. 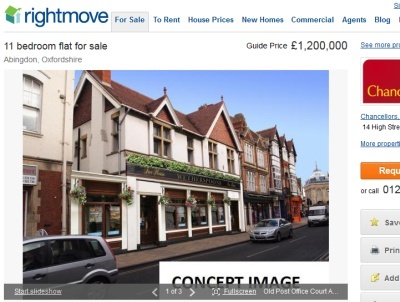 The flat is intended to be bought by a landlord and sublet as units. The real Wetherspoon public house, The Narrows, has its own marketing signs. It offers ‘a bright future‘ to anybody wanting a job, ‘a world of choice‘ for drinkers, and ‘Time for food‘ for anybody wanting food as well. It “Opens 8th October 2013. 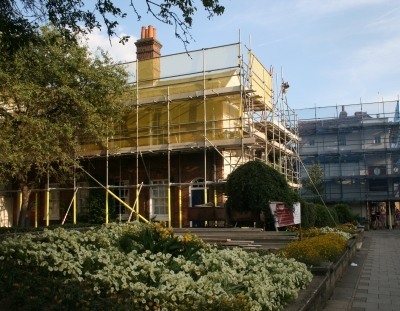 More scaffolding has appeared along Bridge Street today – this time with yellow netting which matches the flower display. After years of being ‘To Let’ somebody is moving into the offices above the Registry Office, with the view onto Roysse Court. 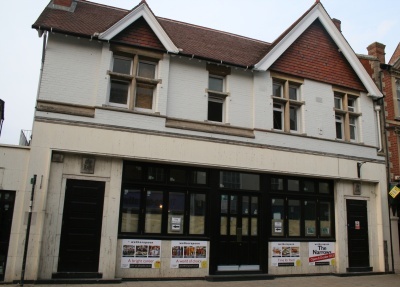 That somebody is Abingdon-on-Thames Town Council who took over ownership of the Guildhall and Roysse Court from the Vale of White Horse District Council in April 2011. 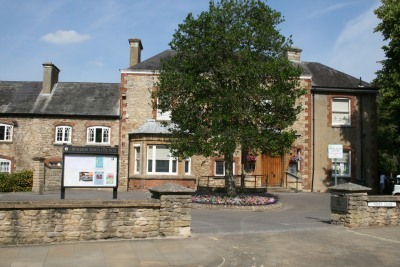 The Town Council is planning to move from its leased offices in Old Abbey House to their own offices in the Guildhall and Roysse Court. 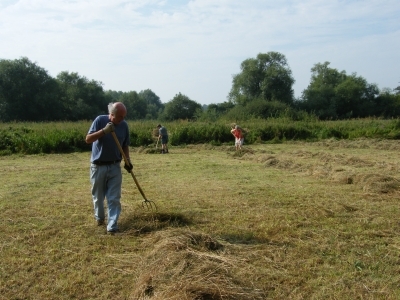 The wildflower meadow in Barton Fields was cut last Wednesday. This year, the farmer who mows it for us was unable to bale the hay, as his baler had broken down. But the hay needs to be taken off the field, as if it is allowed to rot where it is cut, it would fertilise the ground and encourage rank grasses and nettles to flourish. So we called on the help of our Green Team, who turned out in force. Fifteen volunteers took on the task of raking and stacking the hay with pitchforks, from two and a half acres on Thursday and Friday. On Saturday we were joined by thirteen members of the Abingdon Green Gym, who completed the task for us and also helped with a couple of other tasks on site. In total, about a hundred hours of effort was put in by volunteers over the three days. Members of our Green Team undertake annual botanical surveys and weekly butterfly counts in transects across the wildflower meadow and adjacent grassland. The meadow was sown and planted in 2009 and since then we have recorded over 50 species of flowering plant who’s abundance has increased year on year. The number of butterflies in the herb-rich meadow is three times that found in adjacent unenhanced grassland. Bees and other insects also benefit from the meadow flowers. Details of these surveys can be found on the Abingdon Naturalists website: abnats.org.uk/survey.html .